Inflatable Marquees can be custom branded from one end to the other and are perfect for raising awareness of your brand. With extremely eye catching graphics your company will be easily found at any event or trade show. Decoration can be made up of custom colour material, mixed with full colour printed graphics. Any size or style is available. Every seam in the Inflatable Tents are reinforced with an additional two-inch wide strip of vinyl. After the seams are R. F. sealed they are joined together with a double stitch, this creates 4-6 layers of strength. 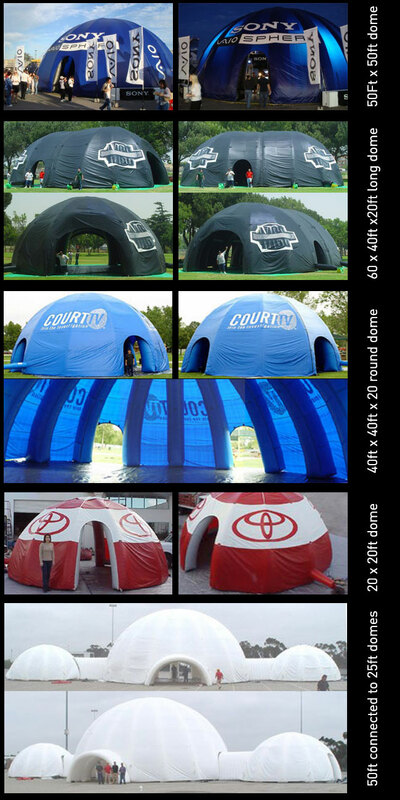 Extensive work goes into constructing each and every inflatable tent, from conception to completion. Our main emphasis in the building process is producing the finest, most durable products in the industry. The involvement in the construction has included years of research and develop a perfect product. From materials to identifying stress points. We engineer Inflatable Tents that are aesthetically appealing and more importantly structurally safe and designed to withstand any type of stress. We make inflatable tents to ANY size you require. Below is just a small portion of what we have produced in the way of promotional marquee tents. The dimensions listed below will give you an idea of the size and scale of these promotional domes. Is another special technique used in our facility to increase the life expectancy of the Inflatable Tent. This technique offers added resistance to all seams and eliminates the additional sewing that is typically necessary for reinforcing high-stress areas. This is all covered in full colour printed outer panels that look amazing when branded with your logo.